Armed with mobile devices as their “anywhere” assistants, today’s holiday shoppers are more informed than ever. The result? Promotion-driven shopping events like Black Friday are no longer anchored to a single day. 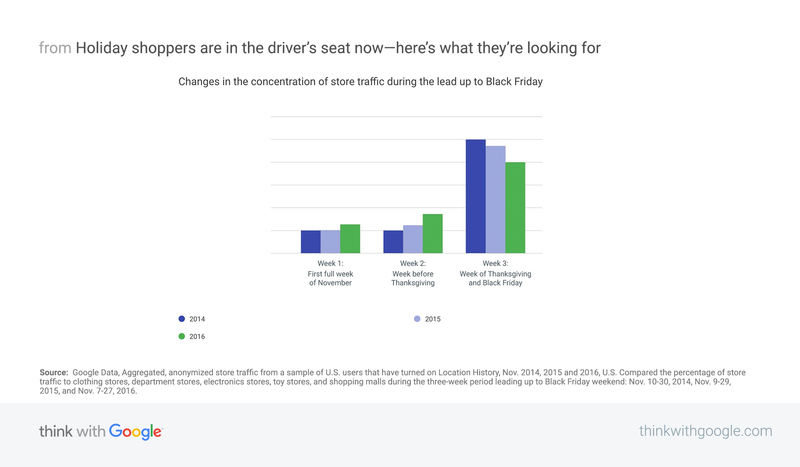 Consumers are now in the driver’s seat—researching to find the best deals of the season before, during, and after Black Friday, and hatching a game plan to determine what, where, and when to buy. With retailers sharing Black Friday deals earlier and earlier, shoppers have a bigger opportunity to make more informed decisions about their purchases. We're seeing these curious consumers lean into holiday shopping research with increasing frequency. Shoppers are trading time spent standing in line for time spent researching everything from door-busting deals to details around specific products. 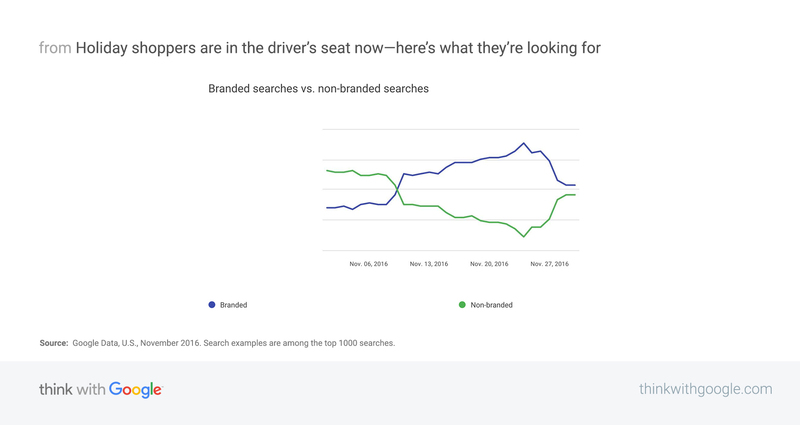 Source: Google Data, U.S., November 2016. Search examples are among the top 1000 searches. Celebrity-backed products are becoming must-haves, with Kevin Durant’s Nike KD 10, Pharrell x adidas, and Rihanna’s Fenty Beauty topping the list. Having done the research and determined what they’re getting and where they’re buying it, today’s empowered consumers are deciding exactly when and how they want to purchase. These factors help explain why Black Friday is becoming less important as an in-store shopping holiday. Source: Google Data, Aggregated, anonymized store traffic from a sample of U.S. users that have turned on Location History, Nov. 2014, 2015 and 2016, U.S. Compared the percentage of store traffic to clothing stores, department stores, electronics stores, toy stores, and shopping malls during the three-week period leading up to Black Friday weekend: Nov. 10-30, 2014, Nov. 9-29, 2015, and Nov. 7-27, 2016. With all that said, it’s easy to see why there’s no longer a huge rush to the store to snap up those doorbuster bargains. Rather than pin their hopes on bagging the perfect sale on Black Friday, customers are finding the best shopping strategy that suits them. 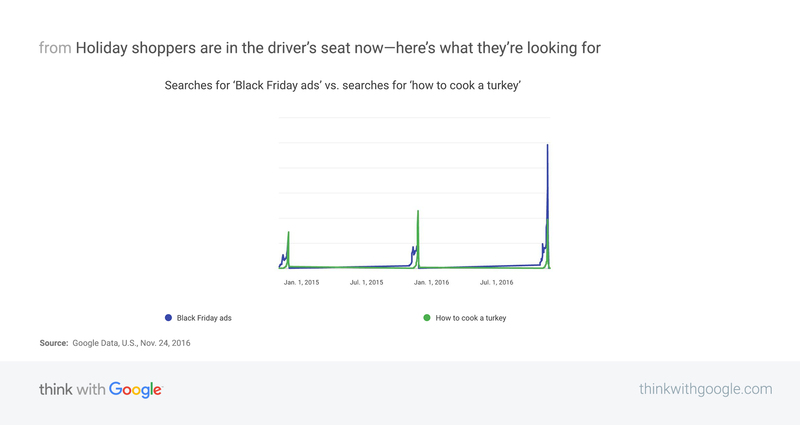 Marketers would be wise to meet shoppers in these varying moments during search, online, and in stores throughout the season. Doing so could mean happier holidays indeed. 2 Google Data, U.S., November 2016. Search examples are among the top 1000 searches. 6 Google Data, U.S., Jan.-June 2015 vs. Jan.-June 2017. 7 Google Data, U.S., Oct.-Dec. 2016. Search examples are among the top 10,000 searches. 8 Google Data, Aggregated, anonymized store traffic from a sample of U.S. users that have turned on Location History, Nov. 2014, 2015 and 2016, U.S. Compared the percentage of store traffic to clothing stores, department stores, electronics stores, toy stores and shopping malls during the three-week period leading up to Black Friday weekend: Nov. 10-30, 2014, Nov. 9-29, 2015, and Nov. 7-27, 2016. 9 Google Analytics, U.S., Jan.-Dec. 2016. Based on data from Google Analytics accounts that have authorized Google to share website data in an aggregate way.